This is my favorite model so far. Then again I was one of the lucky 350 people that had their name drawn for her. I couldn't believe it. I still remember screaming happily into my best friend's ear because I was on the phone with him when I saw my name on the site. I had a halter for her but it has since broke. I will try to repair it when I can find the rest of it. The red looks very good on her. I haven't bought this model yet, because I just can't get past the mane which is very crudely done compared to most other models. It looks like a slab of clay. 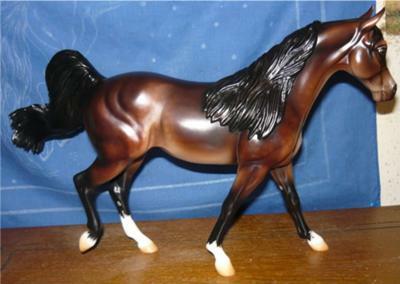 The rest of the model is gorgeous; the pose, the swishy tail, conformation, etc. I just wish they would refine the mane, especially since Arabians generally have very fine, silky manes and tails.